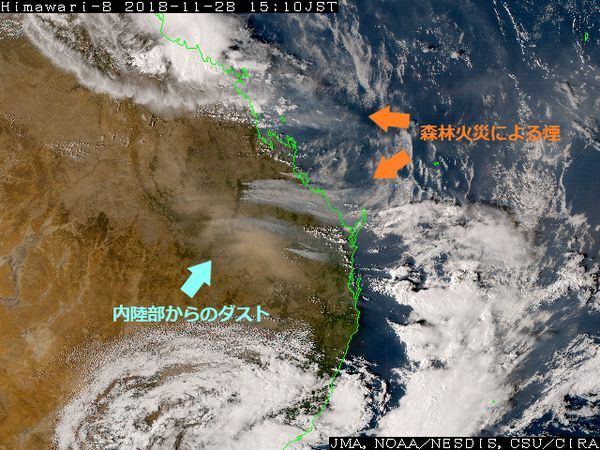 An unprecedented heatwave caused a major bushfire in Australia on 28 November 2018. Smoke (gray) and dust (beige) are seen drifting eastward in this image. 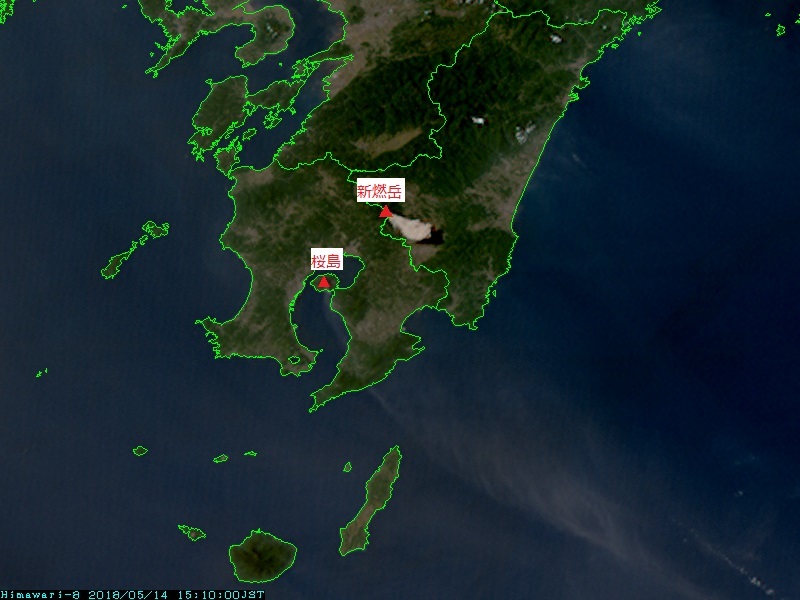 Dense fog was observed in the Tohoku region on 25 November 2018. In Natural Color RGB imagery, fog/low cloud (white) and snowfall on mountains (cyan) are enhanced. 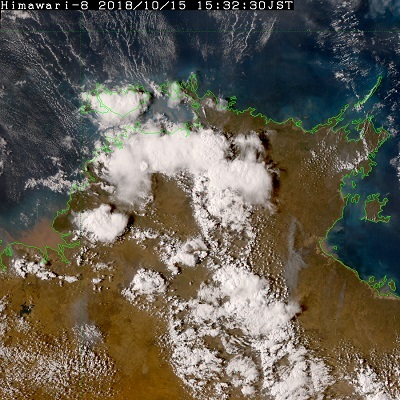 Himawari-8 began to conduct on-demand Target Area observation around Darwin in northern Australia at 06:30 UTC on 15 October 2018 in response to a request made by the Australian Bureau of Meteorology. This is the first operation of the HimawariRequest service. 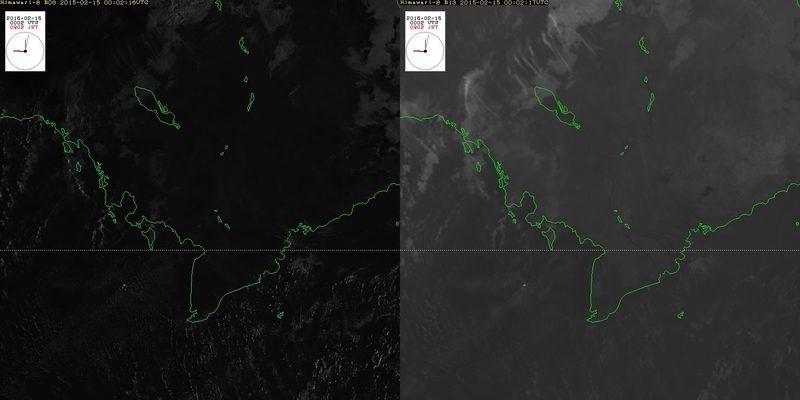 The satellite captured images of rapidly developing cumulonimbus over Australia's Northern Territory. 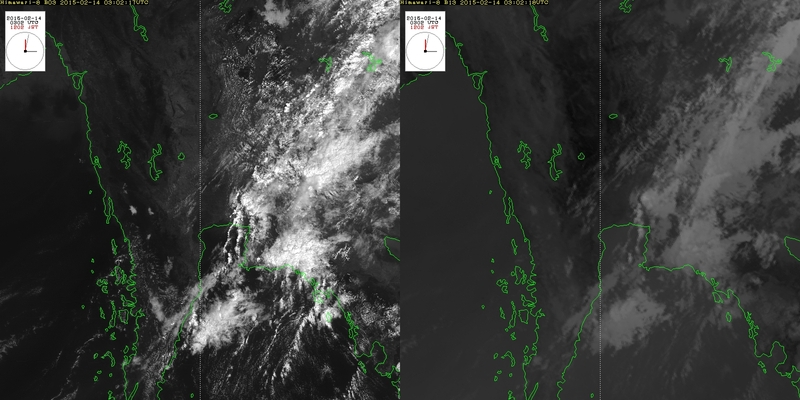 Night Microphysics RGB imagery is highly useful in discriminating fog and low cloud at nighttime, and True Color Reproduction (TCR) imagery is useful for the same purpose during the daytime. 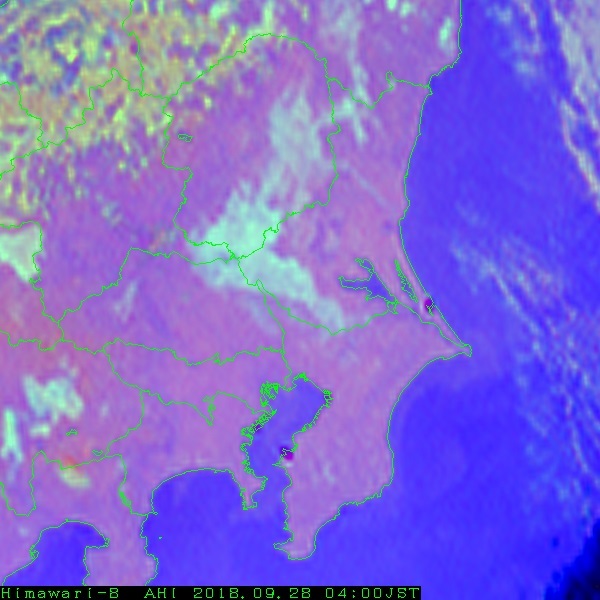 The nighttime imagery shows fog and low cloud in light blue. 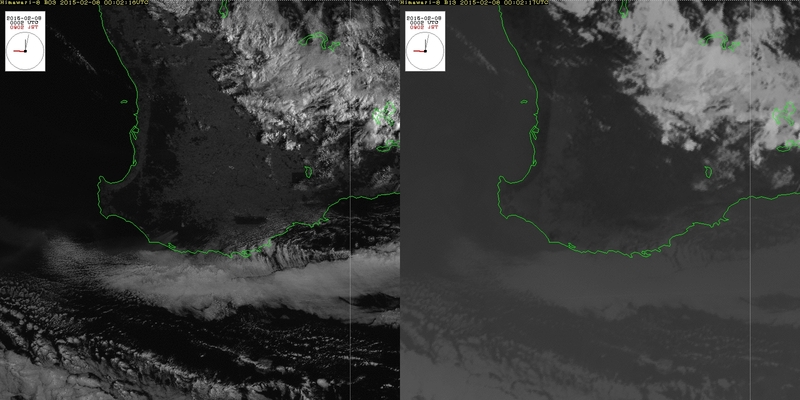 Fog and low cloud shown in white in TCR imagery quickly disappear in the morning. 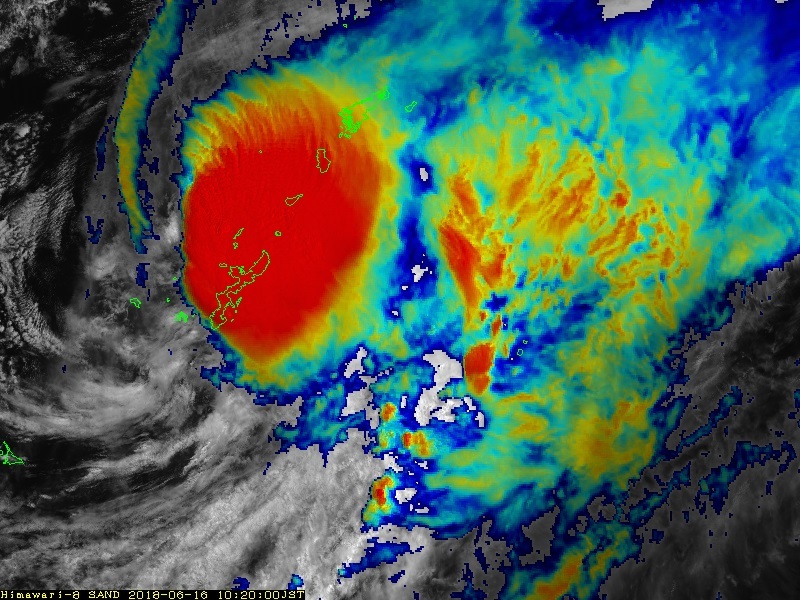 Trami formed as a tropical depression (TD) on 20 September 2018 and approached the Okinawa Islands on 29 and 30 September before making landfall on Wakayama Prefecture with TY intensity at around 11 UTC on 30 September. It brought winds with unprecedented intensity to the Pacific coast side of the country. 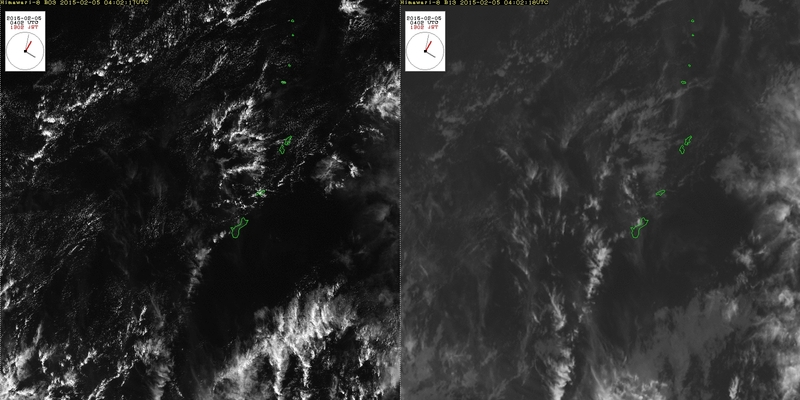 Himawari-8 imagery captured its movement over Japan. 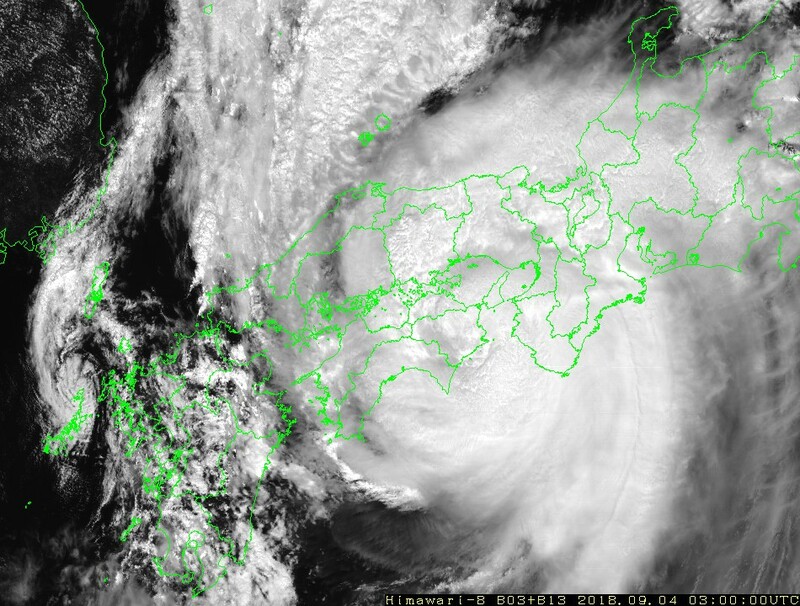 Maintaining very strong TY intensity, Jebi made landfall on the southern part of Tokushima Prefecture on 4 September and again around Hyogo Prefecture on the same day, bringing unprecedented storm surges to the Osaka area that caused serious damage to Kansai Airport. 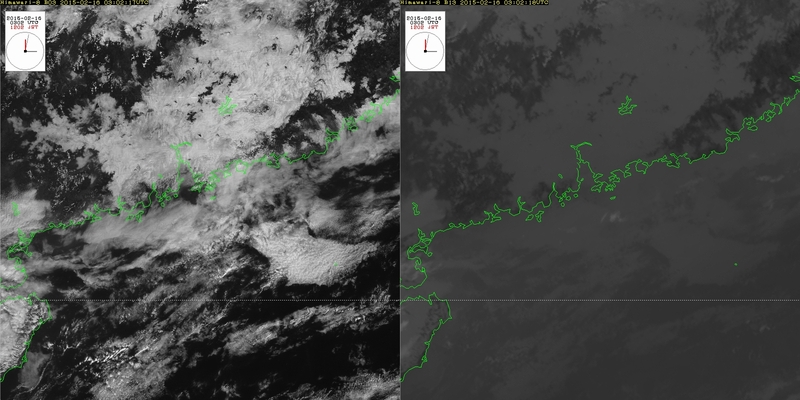 Rapidly developing cumulonimbus is seen over the Japanese islands of Honshu, Shikoku and Kyushu. 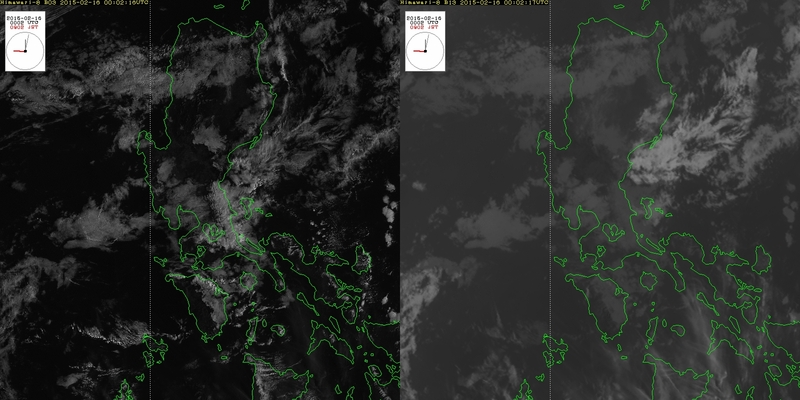 These clouds caused heavy rainfall and thunderstorm conditions over a wide area. 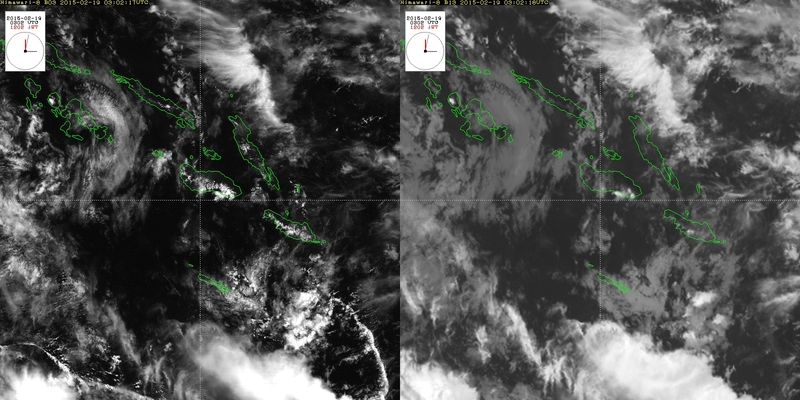 Himawari-8 captured a volcanic ash plume from an eruption of Manaro volcano on Vanuatu. This SO2 RGB image shows eastward-drifting sulfur dioxide in magenta and yellowish-green. 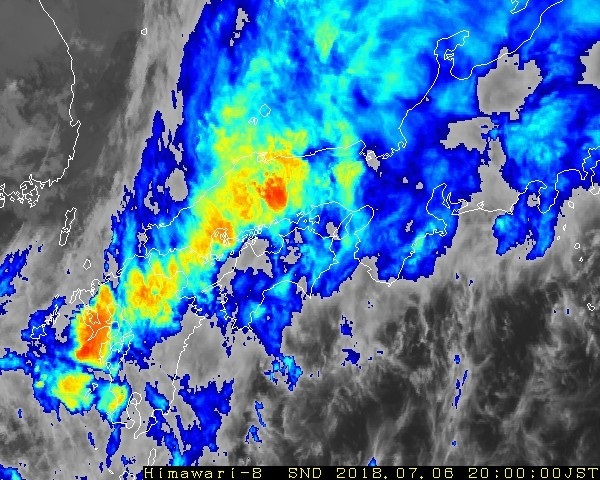 From 26 June to 6 July, the Baiu front remained almost stationary over Japan’s mainland of Honshu and brought unprecedently heavy rain over a wide area. 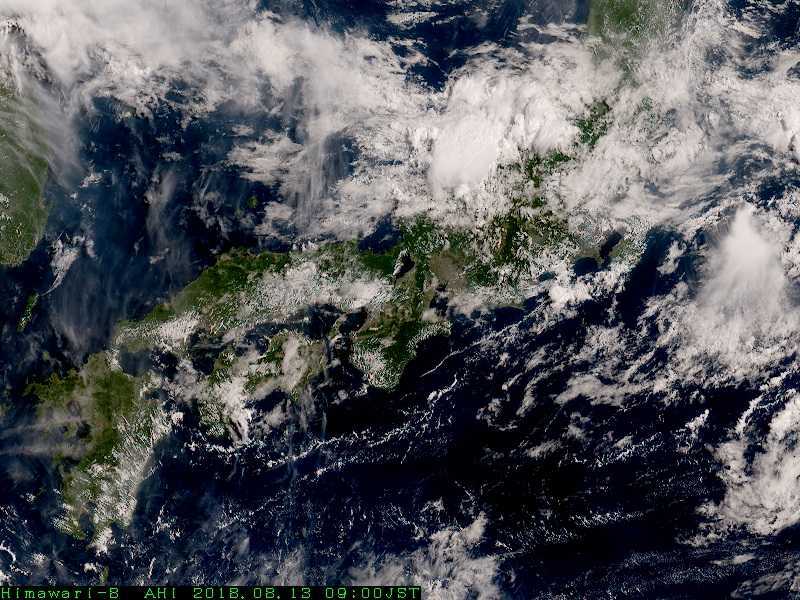 The Japan Meteorological Agency issued Emergency Warnings for heavy rain in the prefectures of Fukuoka, Saga, Nagasaki, Hiroshima, Okayama, Tottori, Kyoto and Hyogo. This sandwich product shows the ongoing development of cumulonimbus clouds. 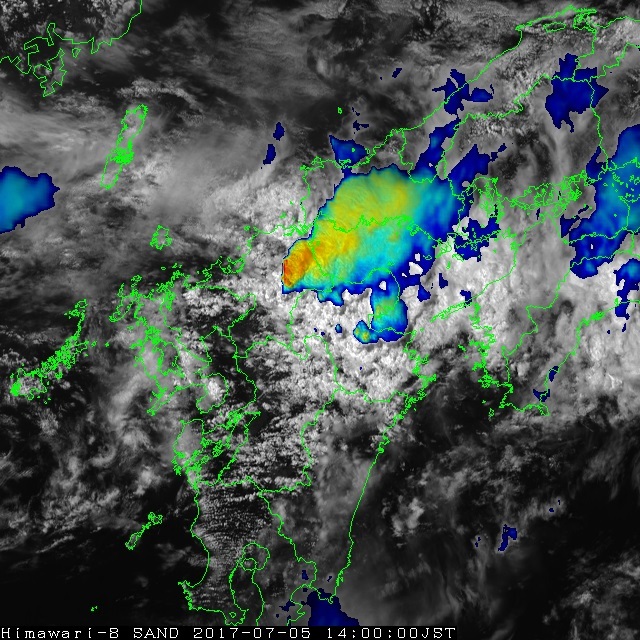 The Baiu front and Tropical Storm Gaemi caused heavy rainfall in Okinawa Prefecture on 15 and 16 June. 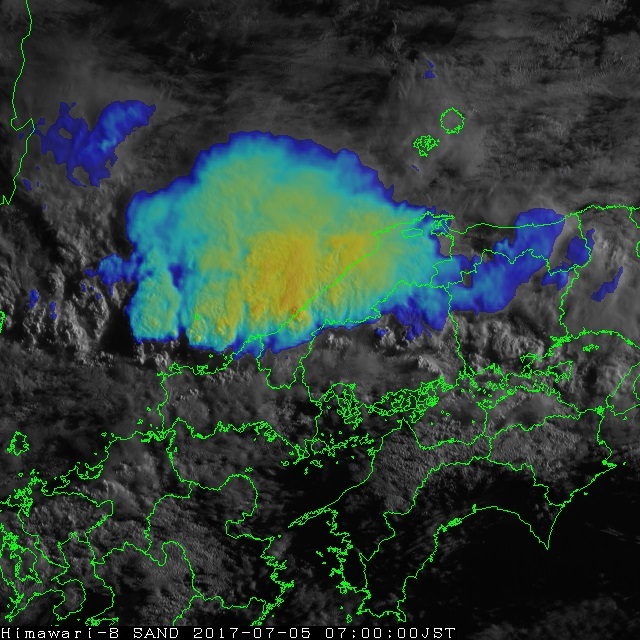 Himawari-8 captured the ongoing development of cumulonimbus clouds in the area. On 14 May, Himawari-8 captured the eruptions of Shinmoedake and Sakurajima volcano (located on the island of Kyushu). 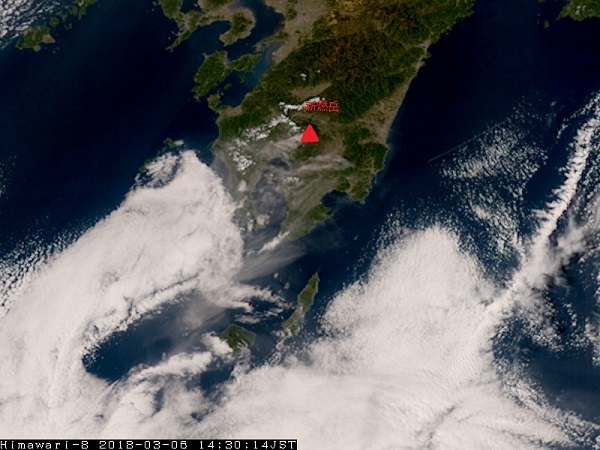 The resulting ash cloud plumes drifted south-eastward. 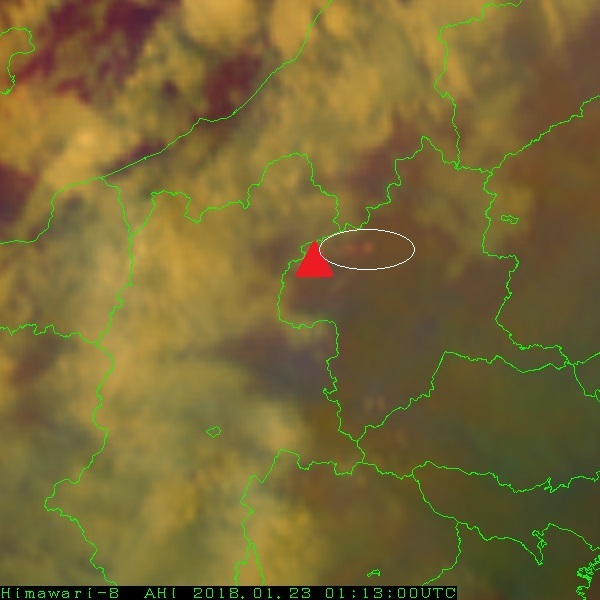 Smoke from a wildfire in the Primorsky region of Russia was captured in Himawari-8 True Color Reproduction Imagery on 27 April. 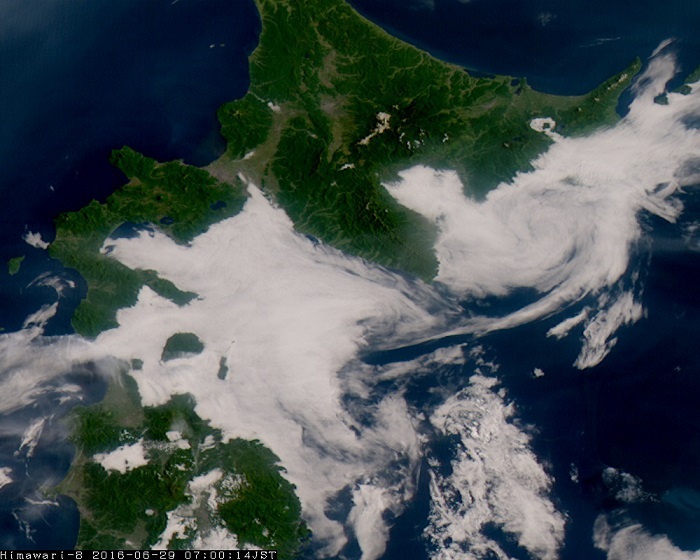 White billows are seen drifting over the Sea of Japan. 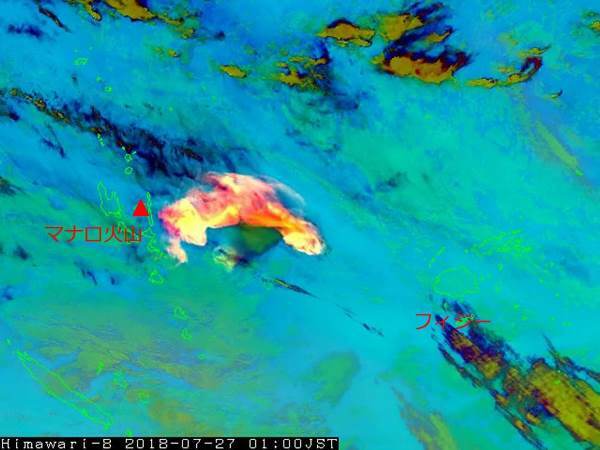 On 6 March 2018, Himawari-8 captured the first explosive eruption of Shinmoedake volcano (located on the island of Kyushu) in seven years. 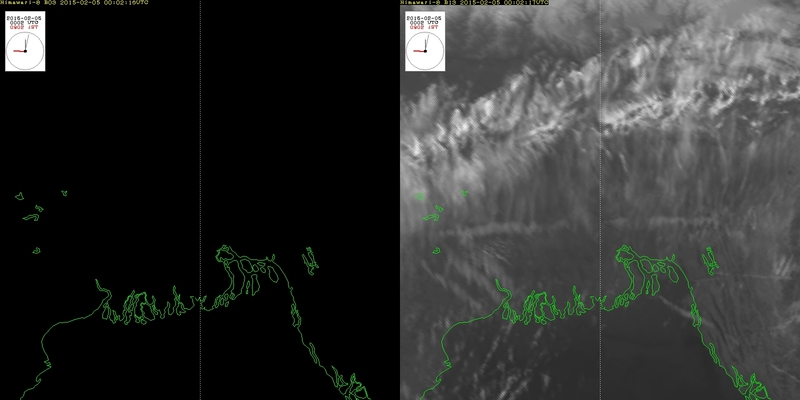 The resulting ash cloud plume drifted southward. From 4 to 8 February 2018, a cold-air outbreak caused heavy snowfall in the Hokuriku region. Himawari-8 imagery captured an area of low pressure and convective clouds over the Sea of Japan. On 22 January, the low-pressure area passed by the Kanto region and brought heavy snow. 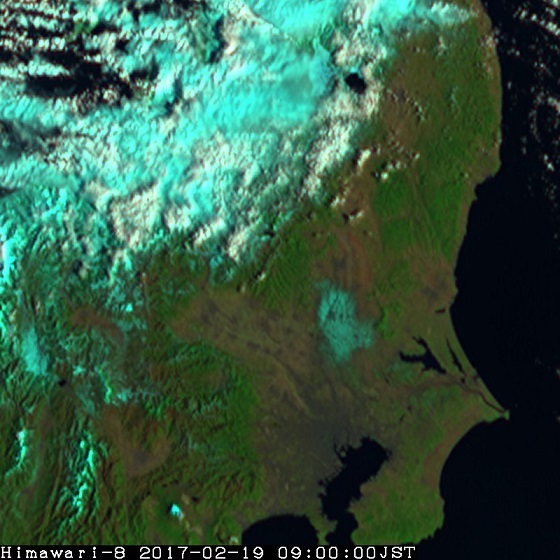 Himawari-8 True Color Reproduction imagery shows white coverage over the Kanto region, representing snow. The area of snow coverage diminished day by day. 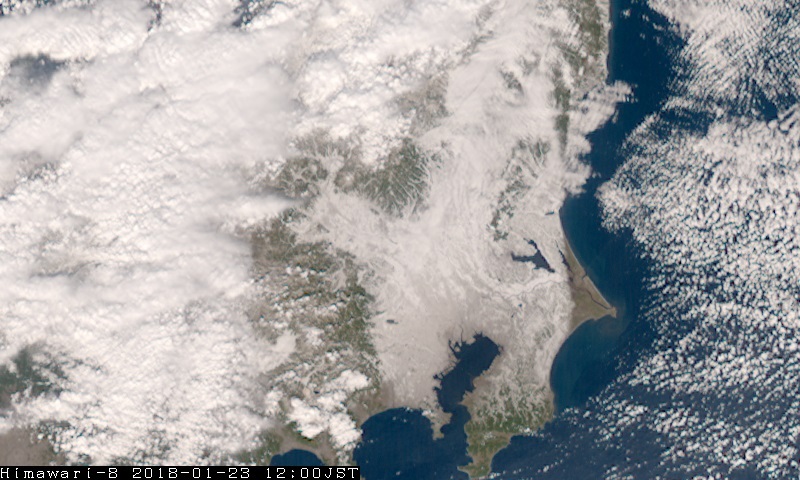 Himawari-8 captured a volcanic ash plume rising from Kusatsu-Shirane volcano on 23 January 2018. 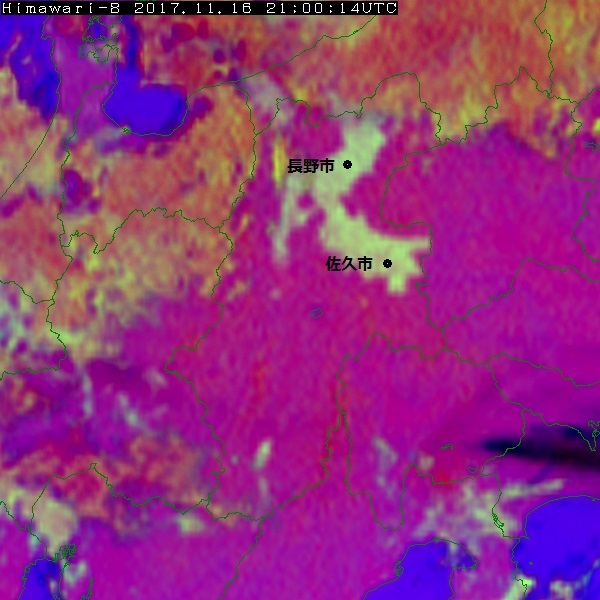 Related Airmass RGB imagery shows an eastward-drifting sulfur dioxide (SO2) plume in magenta. From 10 to 13 December, the Siberian High developed over the Eurasian Continent and the Aleutian Low developed over the northern North Pacific. 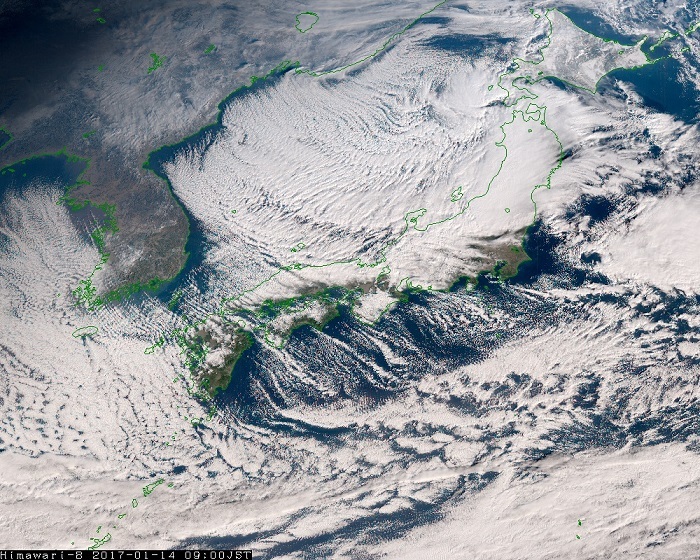 Cold air flowed southeastward across Japan, bringing heavy snowfall to its Sea of Japan side. 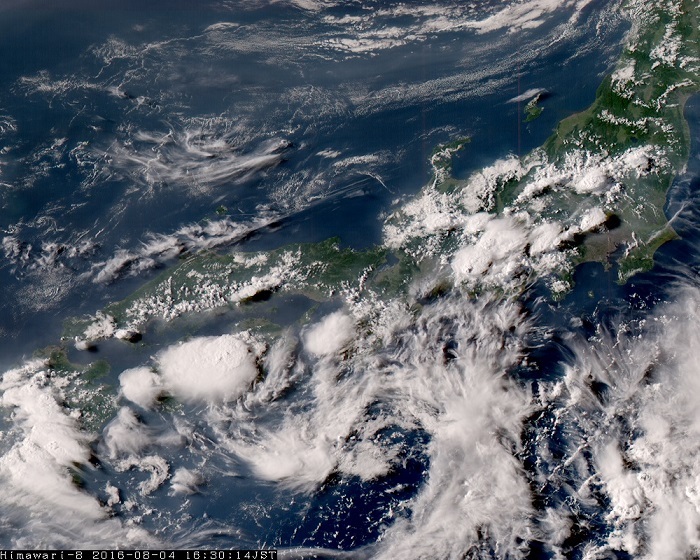 Himawari-8 captured the resulting convective clouds over the Sea of Japan. 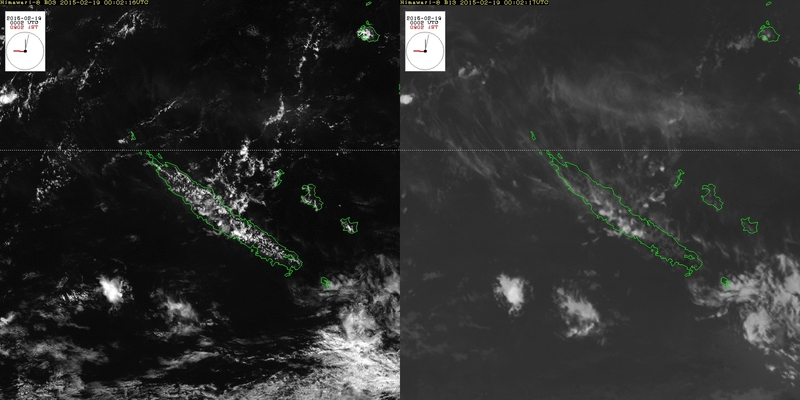 This imagery here shows Night Microphysics RGB composite imagery and daytime True Color Reproduction imagery. 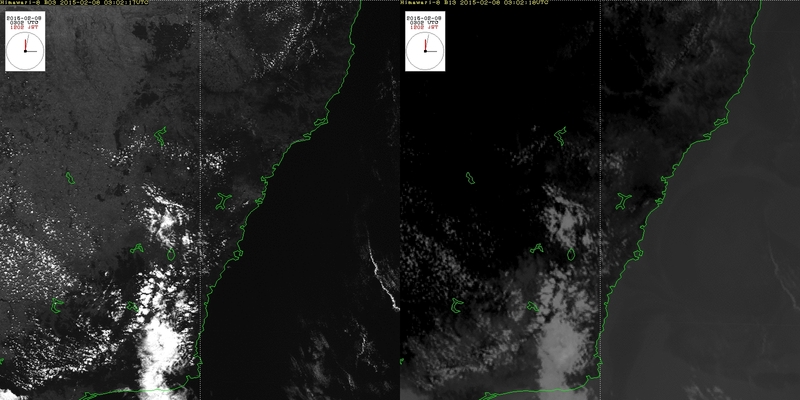 The nighttime image shows extensive coverage of fog and low cloud (yellow-green), which quickly disappears in the morning. 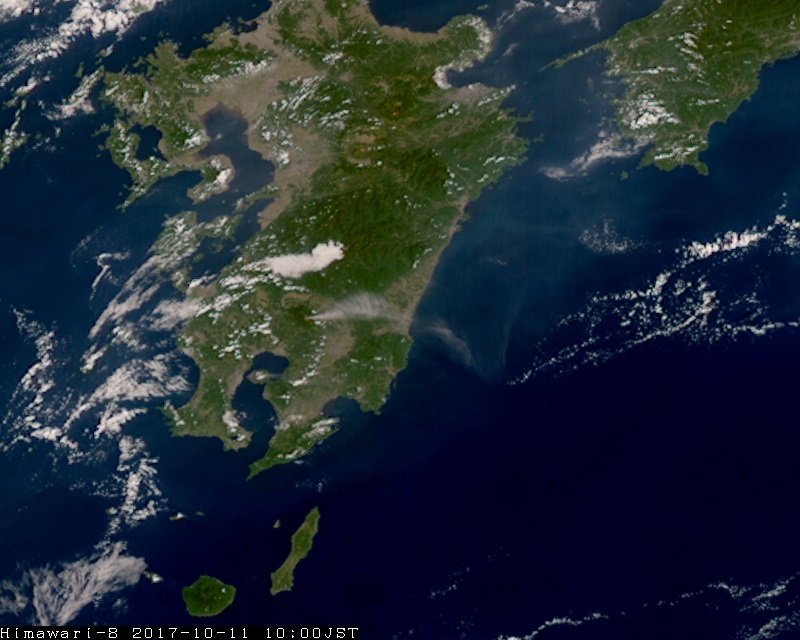 Himawari-8 captured a volcanic ash plume emanating from Mt. Shinmoedake volcano (located on the island of Kyushu) on 11 October 2017. 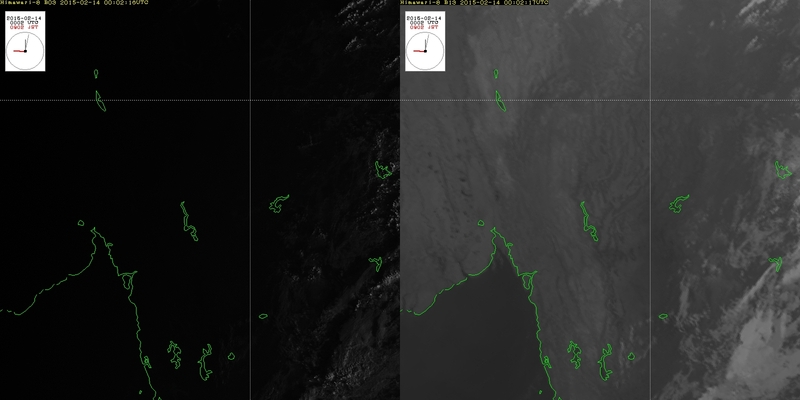 Ash plumes are seen drifting eastward in the imagery. 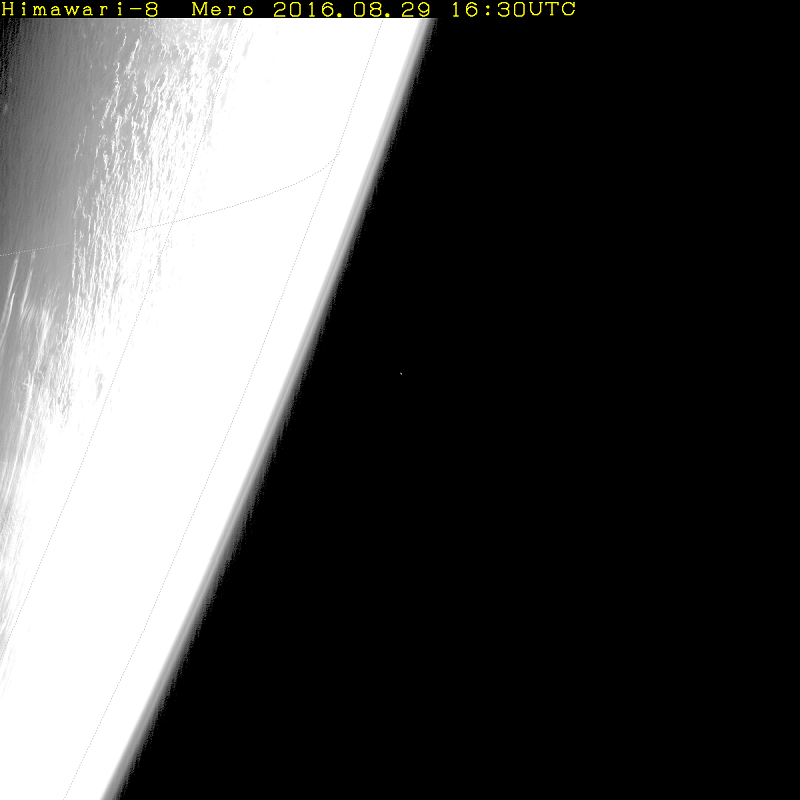 Himawari-8 full-disk earth images captured on the autumnal equinox show a perfect disk with sun glint over the equator during the daytime. The lower images show the winter solstice, the spring equinox and the summer solstice, respectively. 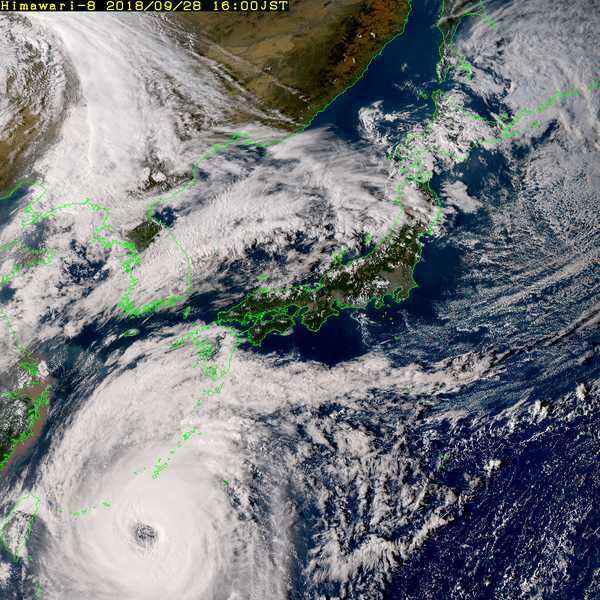 Typhoon Noru continued for 19 days – the second-longest duration of any typhoon since records began in 1951. 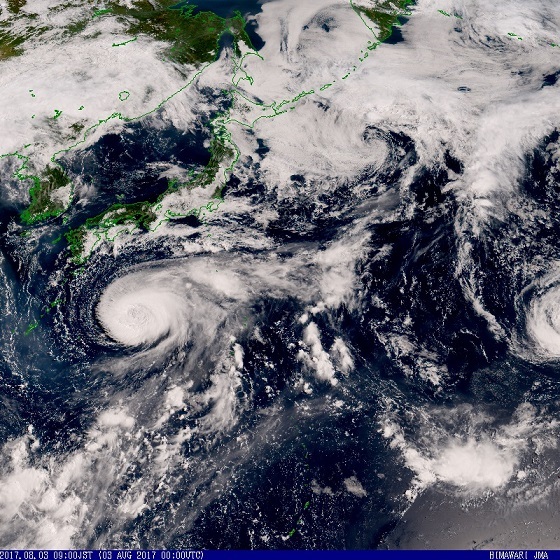 Himawari-8 imagery captured its extensive movement over the Pacific Ocean and its landfall on the island of Honshu. The Japan Meteorological Agency issued an Emergency Warning for heavy rain in the prefectures of Fukuoka and Oita on 5 July 2017. 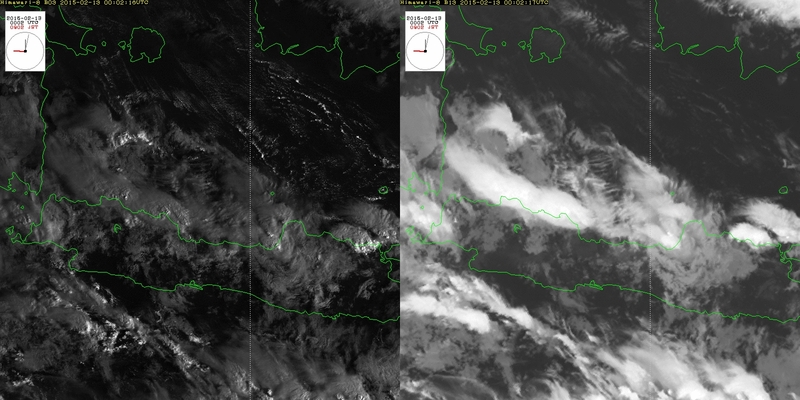 This sandwich image shows the ongoing development of cumulonimbus cloud relating to the event. The Japan Meteorological Agency issued an Emergency Warning for heavy rain in Shimane Prefecture on 5 July 2017. 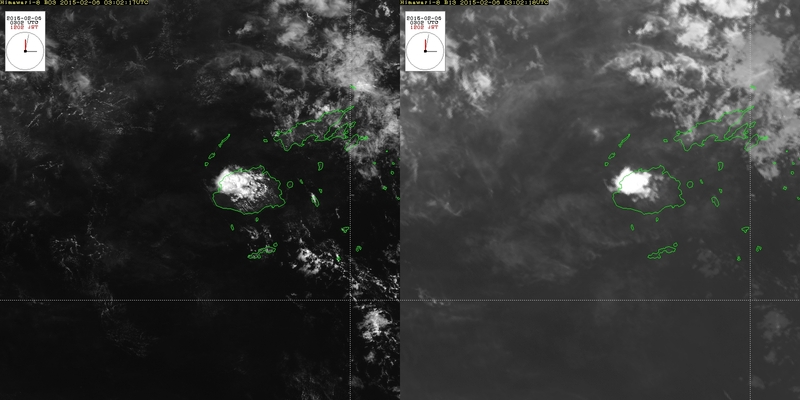 The sandwich product (consisting of two image layers combining visible-band data and color-enhanced IR brightness temperature imagery) is useful for monitoring developing areas of cumulonimbus cloud. 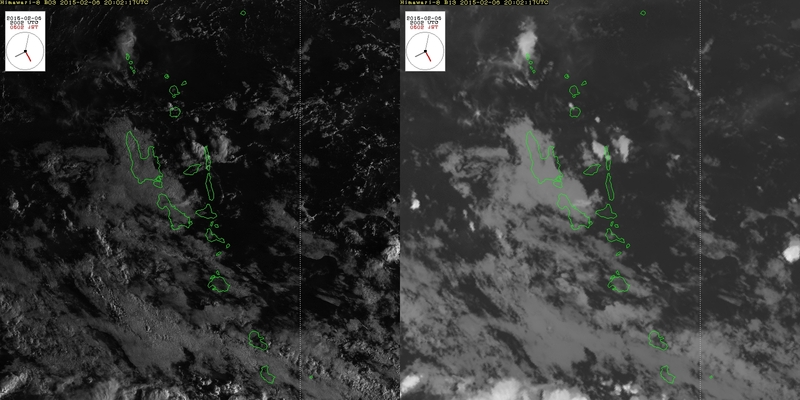 This sandwich image shows the ongoing development of such cloud. 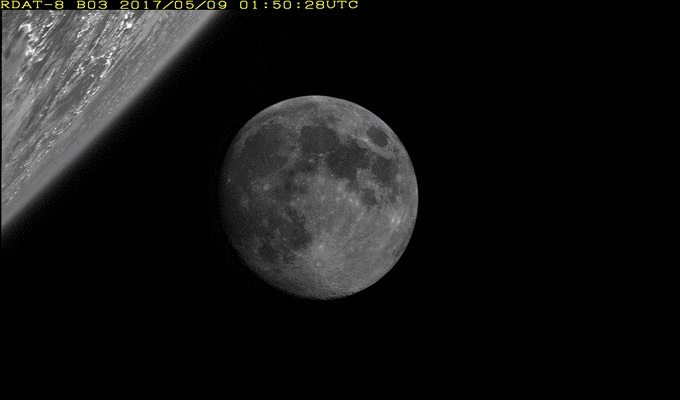 The moon is an interesting Himawari-8/9 target; based on predicted moon positions, satellite imagery captures it as it passes by the Earth, and the resulting data are used to validate the quality of Himawari-8/-9’s output. 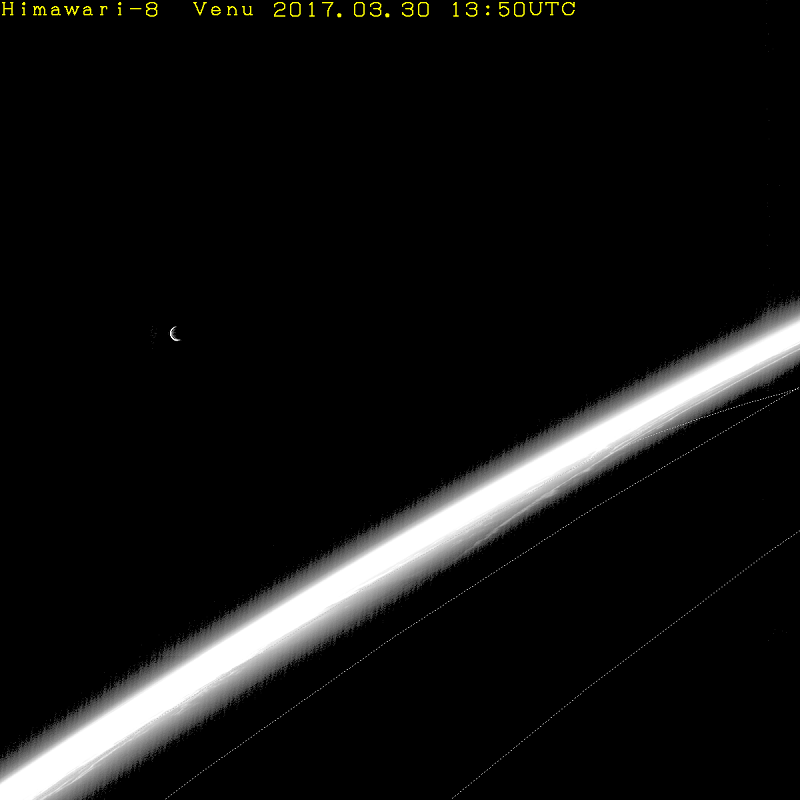 On 9 May 2017, Himawari-8 captured images of the moon appearing from behind the Earth and moving eastward. 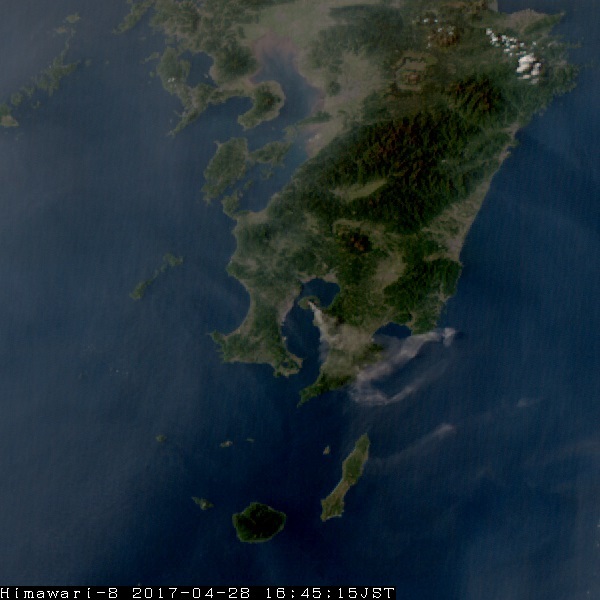 Volcanic ash plumes from the eruption of Sakurajima volcano (located on the island of Kyushu) were captured in Himawari-8 imagery on 28 April 2017. Brown plumes can be seen drifting southeastward. 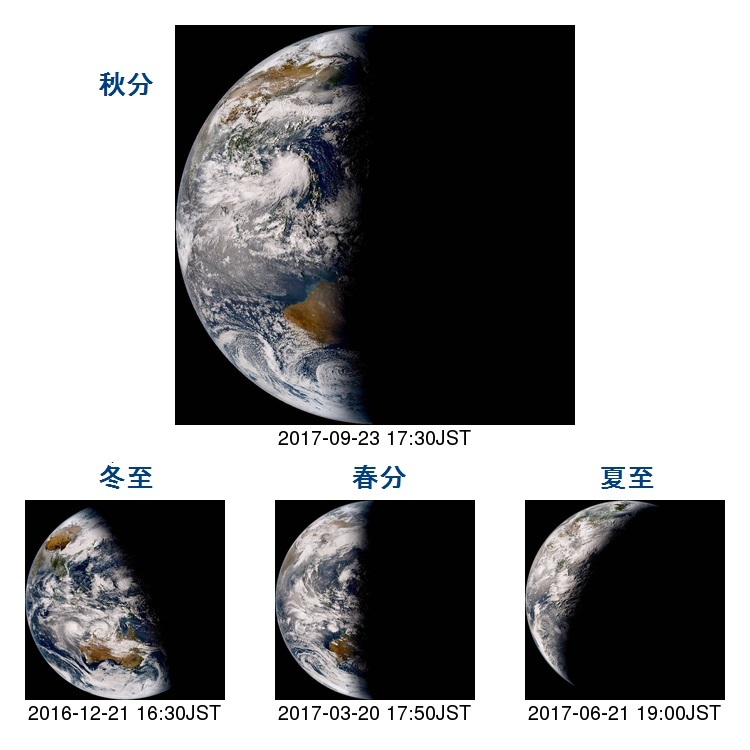 Himawari-8 occasionally captures images of planets viewed at the edge of the Earth depending on the satellite’s relative position. This image shows Jupiter on 18 April 2017. 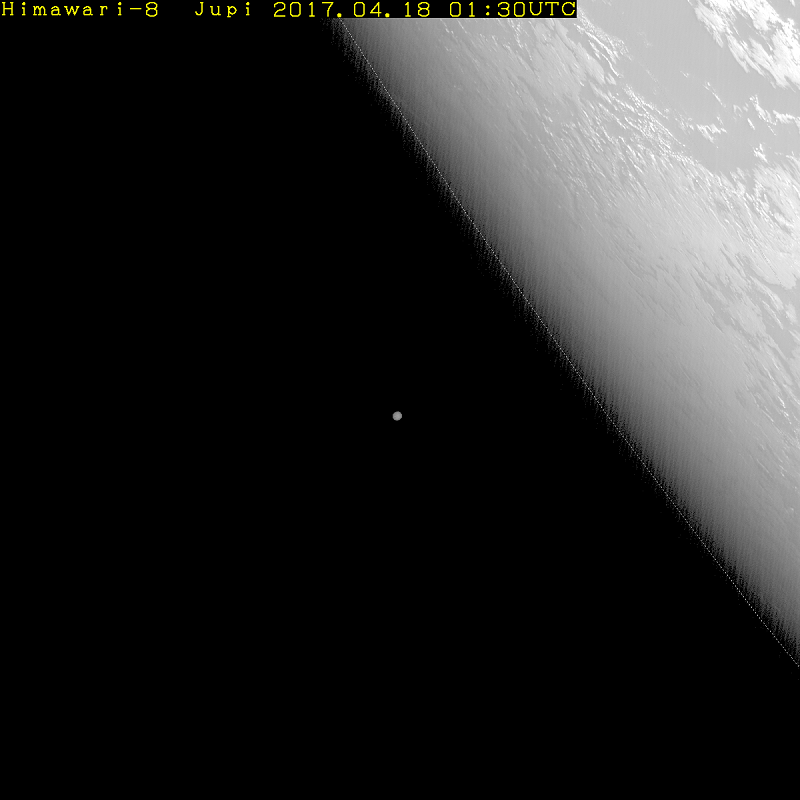 Himawari-8 occasionally captures images of planets viewed at the edge of the Earth depending on the satellite’s relative position. This image shows crescent Venus on 30 March 2017. Snow cover is enhanced in cyan in this natural-color RGB image, and gradually disappears during the daytime. On 17 February 2017, Himawari-8 images captured dust picked up by strong southwesterly winds moving out to sea (shown in brown). 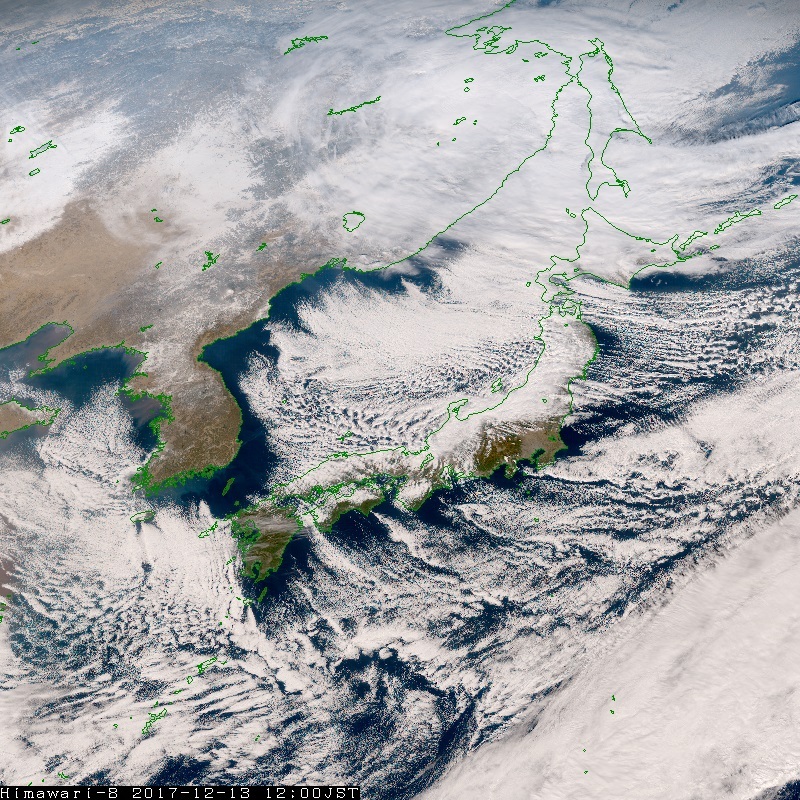 Himawari-8 images captured cloud streaks reflecting a strong winter pressure pattern over the Sea of Japan. 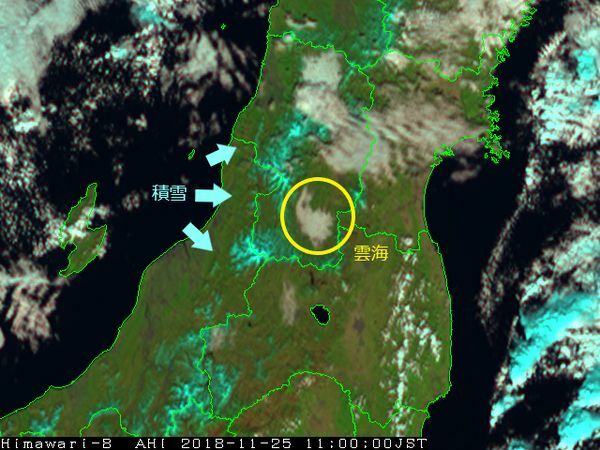 Developed cumulonimbus clouds are clearly seen over the Hokuriku region. Himawari-8 occasionally captures images of planets viewed at the edge of the Earth depending on the satellite’s relative position. 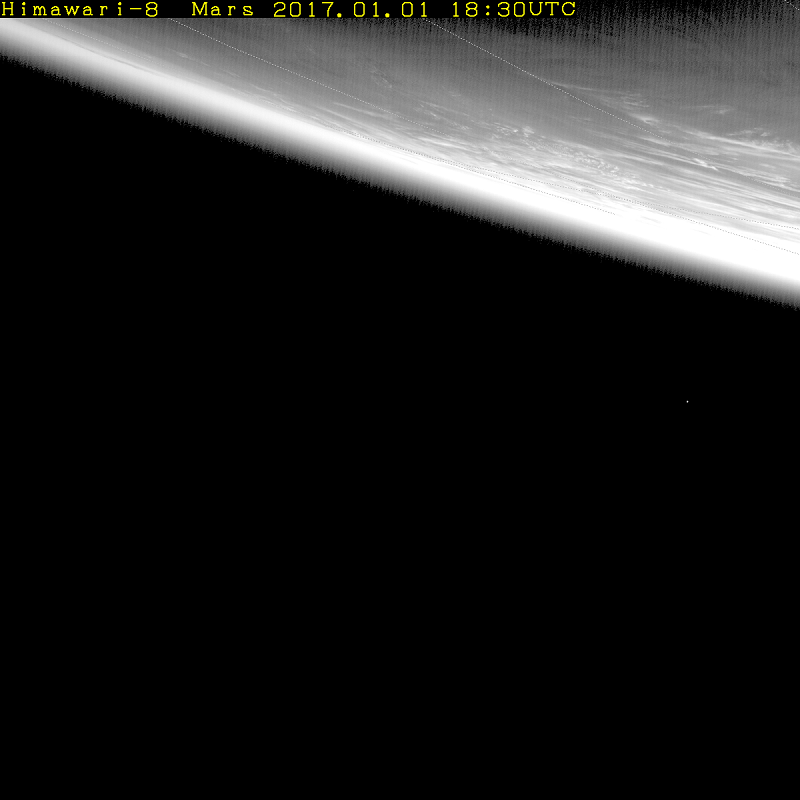 This image shows Mars on 2 January 2017. Himawari-8 observes Japan and the surrounding area at 2.5-minute intervals. 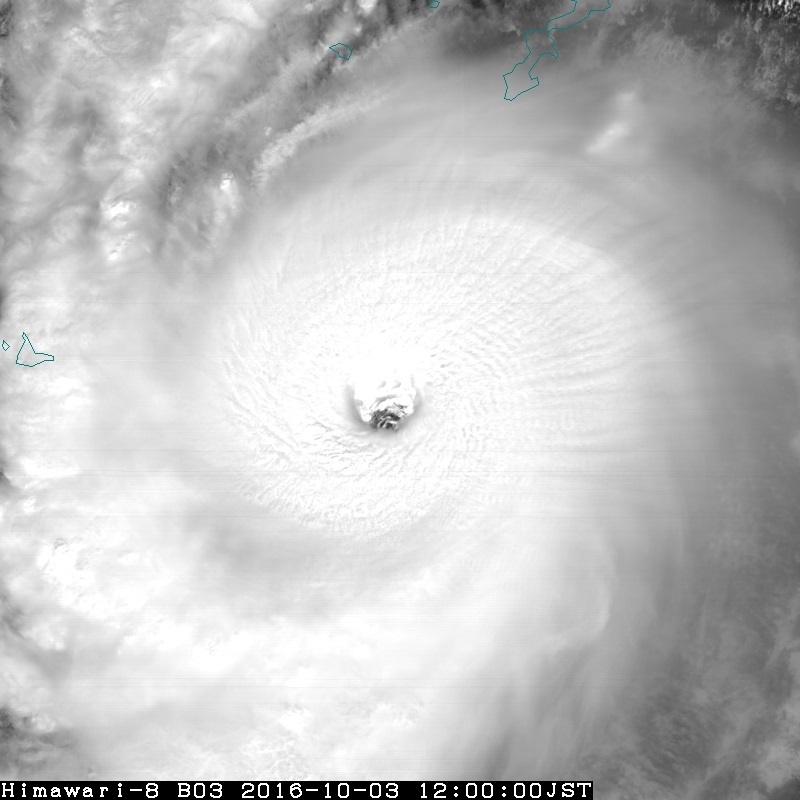 This high-frequency image shows a distinct typhoon eye and fractional low-level cloud swirling within it. Himawari-8 occasionally captures images of planets viewed at the edge of the Earth depending on the satellite’s relative position. This image shows Mercury on 28 August 2016. Himawari-8 captured images of rapidly developing cumulonimbus over the islands of Honshu and Shikoku on 4 August 2016. 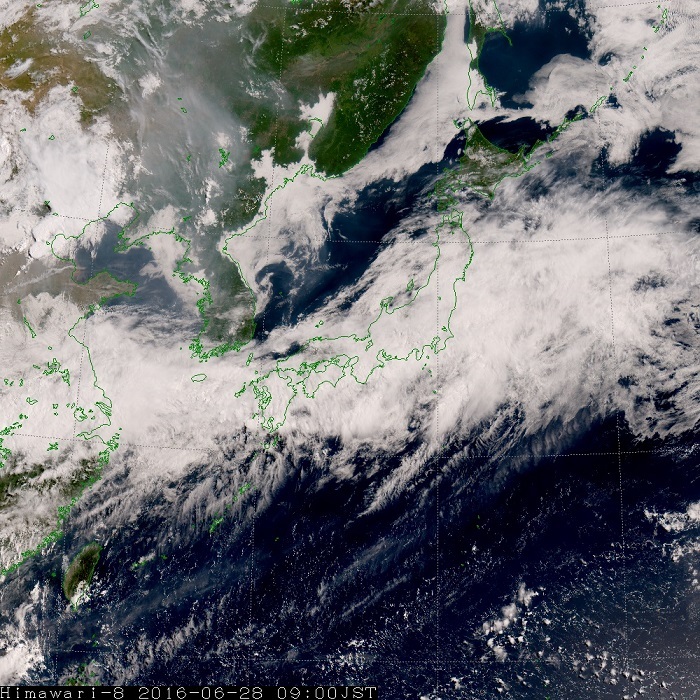 In the afternoon, these clouds brought heavy rain along with thunder and lightning to western and eastern Japan. 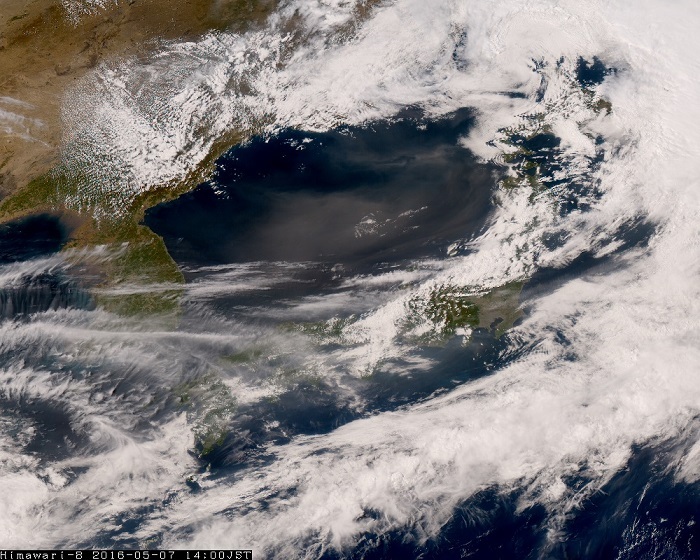 This true color reproduction (TCR) image from 29 June shows fog and low cloud over northern Japan. Both began to dissipate over land during the daytime. 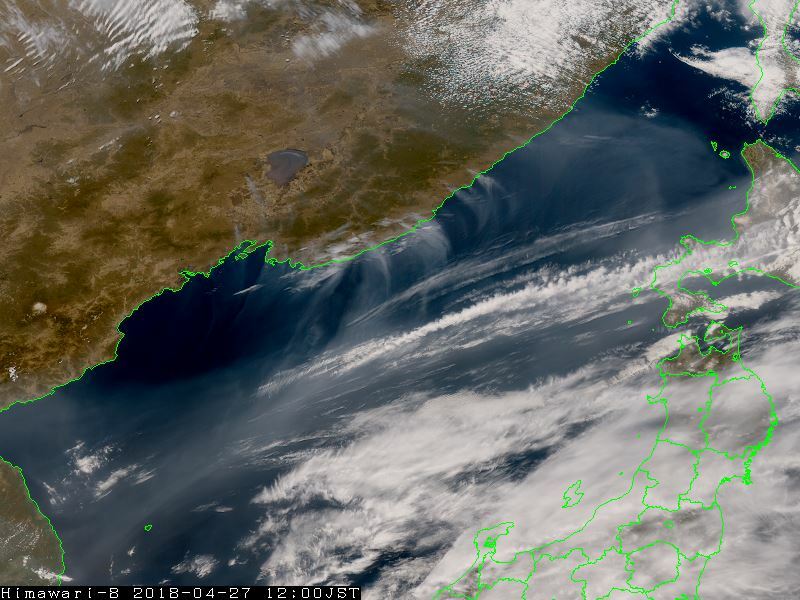 The Baiu front is an almost-stationary rain front observed from late spring to early summer around Japan. 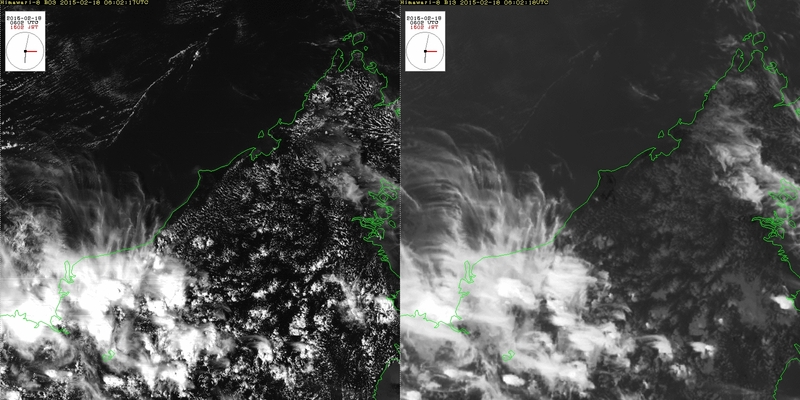 Himawari-8 imagery captured a corresponding cloud band. True color reproduction (TCR) enables the display of Earth images taken from space in a way familiar to the human eye. 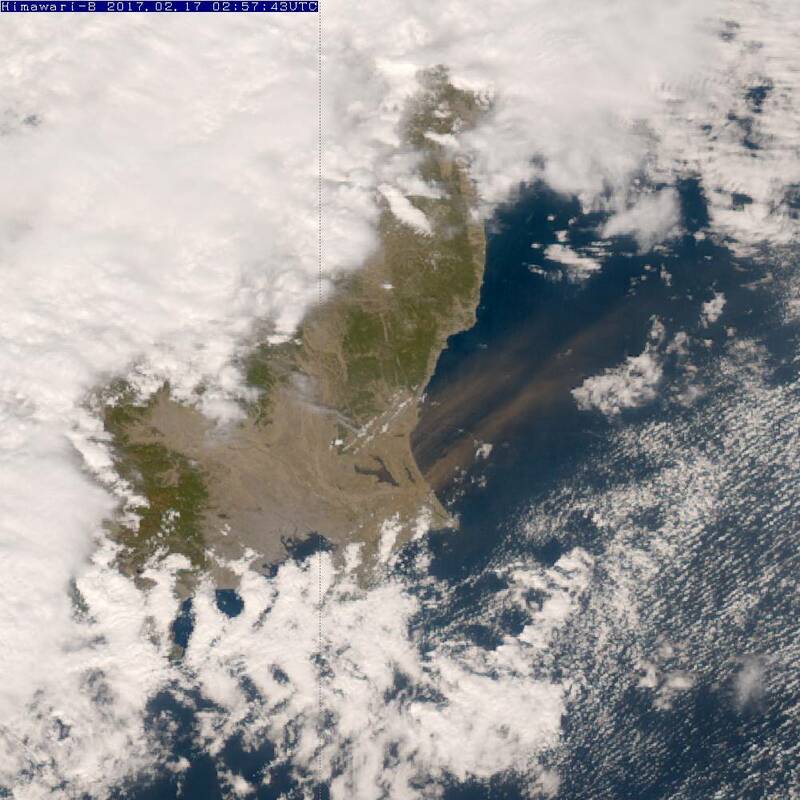 Asian dust can be seen in brown over the central Sea of Japan. 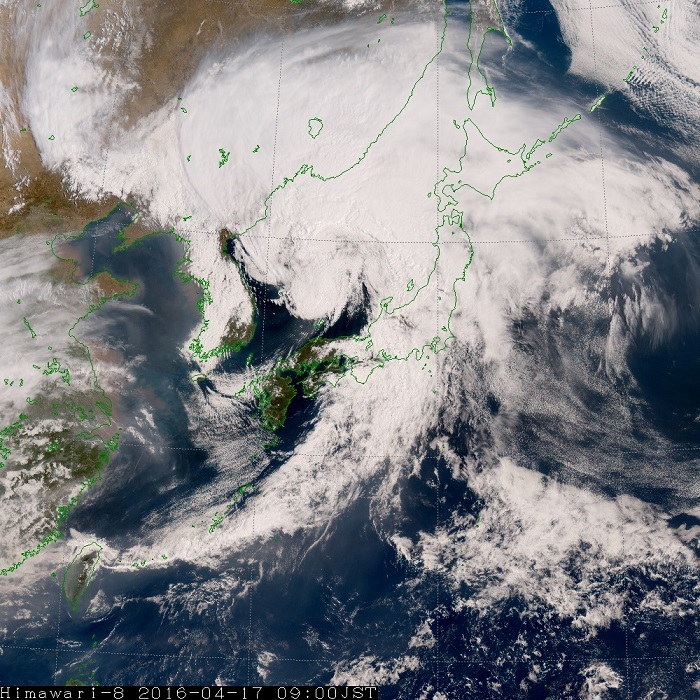 Himawari-8 captured a cloud band corresponding to a developing low with a cold front over the Sea of Japan from the island of Honshu to Taiwan. 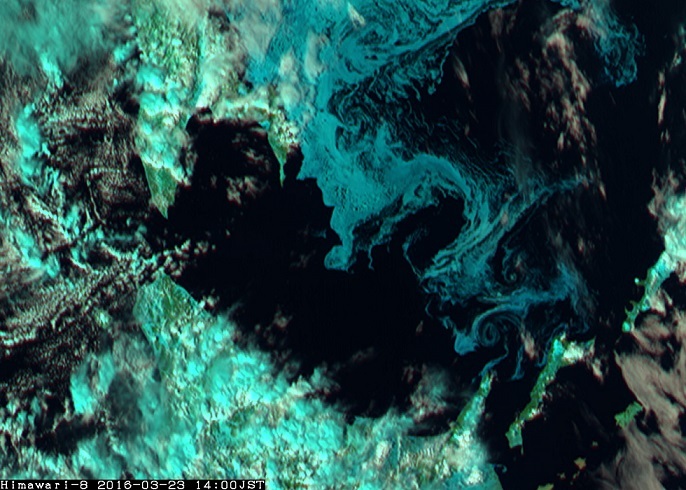 Ice created by seawater freezing in the northern Sea of Okhotsk drifts to coastal waters off Japan’s northern island of Hokkaido under the influence of ocean currents and wind. Himawari-8 captured such ice enhanced in cyan in natural color RGB images. 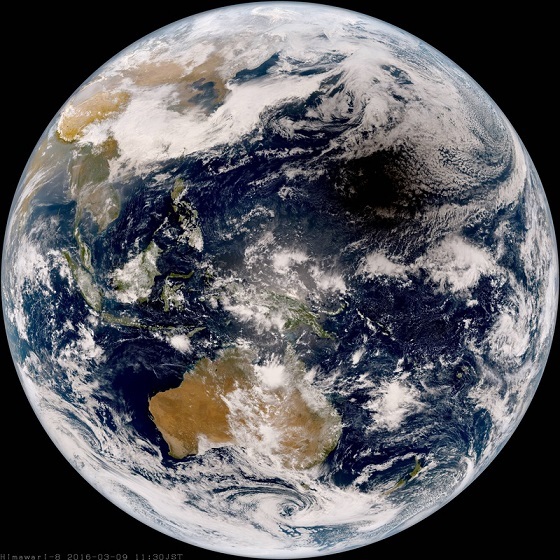 Himawari-8 imagery captured the shadow of a total solar eclipse that occurred on 9 March 2016. 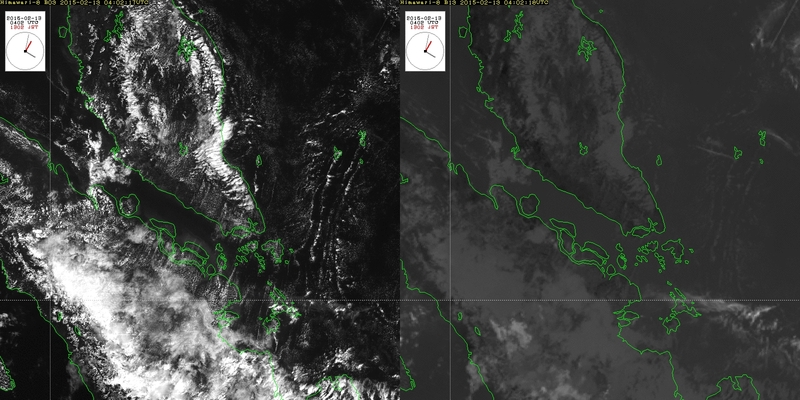 The animation file shows the shadow of the moon passing from south-east Asia to the Pacific Ocean. In the in-orbit commissioning phase, Himawari-8 conducted target-area observation every 2.5 minutes.